This couple, a deputy Sheriff and a firefighter from Gainesville, Florida were visiting on the Carnival Inspiration. 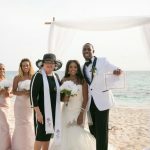 Their wedding had to be a complete surprise for the friends and family members who were traveling with them. We had to do a little dodging around town not to bump into the others before the appointed hour. W and K told their party to meet them at Alfresco's Restaurant in West Bay, as they were going to take them all to Hell (which is just down the road). Of course when they turned up in different clothes, everybody realised something was up. The Groom holds the Certified Marriage certificate aloft, and catches a quick kiss after the ceremony. These are the ones who made it! Then I put them all in a taxi to continue the celebration at Jimmy Buffet's Magaritaville, on the waterfront in George Town. 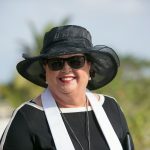 It is really very simple to "Get Married in the Cayman Islands" when you are on a cruise. 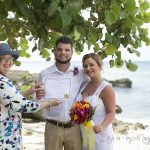 The process of getting a Special Marriage License can quickly be handled by your Marriage Officer once you have arrived on the island. Be sure that your Registered Marriage Certificate is included in your wedding package, no matter how simple the arrangements. You will need this proof of the legality of your marriage when you return home. For the wedding above, I filed their marriage with our public records office this morning, will pick up their RMC tomorow morning and it will be in the post to them the day after their wedding! 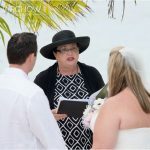 Call Simply Weddings by Joy for your Destination Cruise Wedding in the Cayman Islands (345)5256551 or email me at mywedding@candw.ky. I am currently booking weddings for 2009, book early I do only one cruise wedding per day. Deposit required to book your day and time, refund policy for your protection- a member of the Association for Wedding Professionals International.